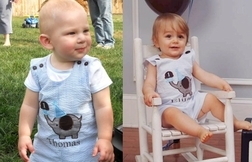 Caroline Bradlee Designs > BIRTHDAYS > BOYS > Boy's Birthday Elephant Cupcake, 1st Birthday Custom Outfit. Boy's Birthday Elephant Cupcake, 1st Birthday Custom Outfit. 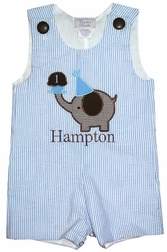 The little elephant can't wait to celebrate your little boy's birthday! Here we have taken light blue striped seersucker and made a John John, but it is also available as a longall. The John John/longall's shoulder straps are fastened with brown fabric covered buttons to match the elephant's ear. 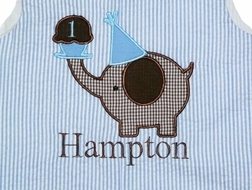 The front of the outfit is appliqued with the elephant who is made with brown gingham, a brown ear, and is wearing a blue party hat. The cute little elephant is also holding a blue cupcake with chocolate icing on a plate. The icing is embroidered with the number of birthday your little boy is celebrating. Monogram his name under the elephant for personalization.